The nature of northern bog environments makes them especially susceptible to methane releases triggered by warmth. In the far north, spring rains may be bringing something more ominous than flowers. 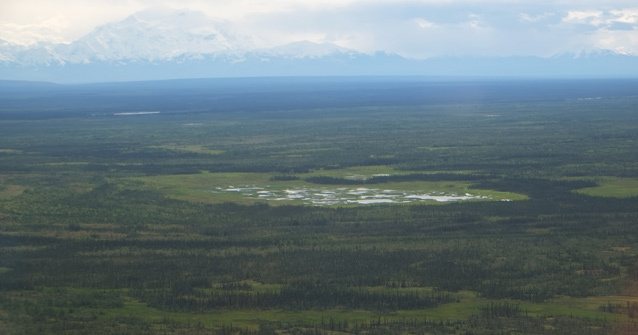 When those spring rains fall on permafrost bogs, they trigger an increase in methane emissions, according to a new study that focused on the interior Alaska boreal forest. The study, published in the journal Geophysical Research Letters, uses results from a site at the Bonanza Creek Experimental Forest near Fairbanks. A comparison of rainy and dry seasons found that emissions of methane from the bog into the atmosphere were about 30 percent higher in the season with a lot of rain. The explanation: Spring rain flushes heat into bogs with soils that would otherwise be still cold from winter. “The rain has roughly the same temperature as the air,” said Rebecca Neumann, a University of Washington environmental engineering professor and the study’s lead author. The study used measurements taken in 2014 and 2016, when springs were rainy, and in 2015, which was a dry year. The take-home message, Neumann said, is about “the ability of rain to transport thaw energy into the bog and very quickly change soil temperatures.” Without rain, bogs warm up from the sun’s rays, “but it’s usually a gradual warming,” she said. The very characteristics of northern bog environments make them susceptible to warmth-triggered methane releases. Their water comes from seasonal thaw of the permafrost’s active layer. The permafrost below holds vast stores of sequestered carbon, plant and animal matter that accumulated over hundreds and thousands of years. That water atop does not drain into other water bodies — a defining characteristic of all bogs. When bog soil is warmed by rain, the microbes within it become more active, consuming sequestered organic matter and expelling methane gas as a waste product. The study also pointed to a second force that increases methane production in rainy weather: the growth of plants, which is stimulated by spring rains. “Plants have a key role in feeding methane production and transporting it up to the atmosphere,” Neumann said. Specialized plants have evolved to thrive in the anaerobic environments of bogs. In permafrost bogs like the Bonanza Creek test site, those plants are sedges and grasses with hollow structures that enable them to grow in an environment that lacks oxygen. But those hollow structures, it turns out, are effective at transporting methane from the warming soil to the air. The 30 percent increase in methane emissions was uneven across the entire bog, the study found. Measurements made by tower-mounted sensors above the bog — a landscape roughly the size of a football field — recorded that level of rain-induced increase, Neumann said. But measurements taken at a much finer scale, with ground-mounted devices that were able to collect gases directly from the soil, found much bigger methane increases were at the edges of the bog. It appears that the rain, which penetrated down into the bog to a depth of 80 centimeters, creates the biggest effects as it slopes down, Neumann said. That suggests that bog shapes and configurations also play a role in the amount of rain-driven methane release. The findings are potentially troubling. As a greenhouse gas, methane is far more powerful — about 30 times as powerful — as carbon dioxide. The vast stores of sequestered carbon in permafrost could dramatically increase greenhouse gas emissions, particularly in the form of methane, if that permafrost thaws. And more rains are expected in the far north. As the Arctic warms, total precipitation is increasing, raising the specter of more rain-driven permafrost thaw. Already in Alaska, measurements at 18 National Weather Service stations showed that average total precipitation increased by 17 percent from 1949 to 2016, according to a 2017 study led by Gerd Wendler of the Alaska Climate Research Center at the University of Alaska Fairbanks. “This observed warming of Alaska is about three times the magnitude of the mean global warming and allows the air to hold more water vapor,” said that study, published in the journal Atmosphere. Neumann said she and her colleagues are planning to follow up with more studies of rain effects on permafrost thaw in other regions.